A unique and important opportunity! 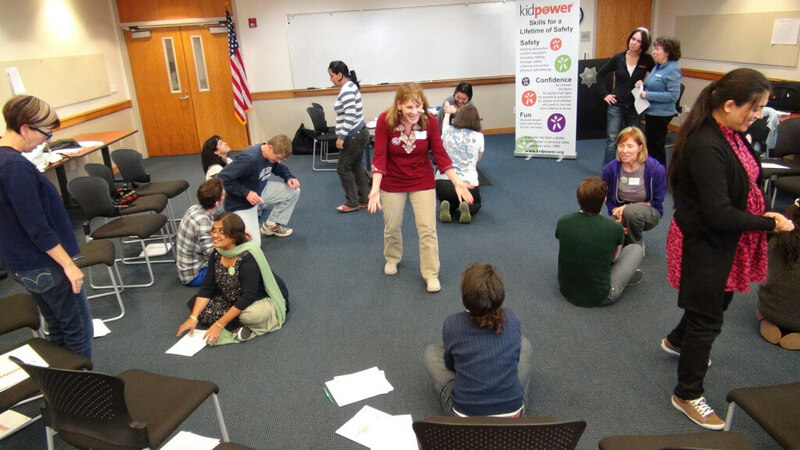 Come learn and practice Kidpower’s internationally-recognized intervention, advocacy, and social safety strategies and skills so you can protect and empower people of all ages and abilities in your organization, school, agency, or family. Proudly celebrating our 7th year of this unique training for people from around the world! Register in April to save $150 – plus 20% Group Discount! 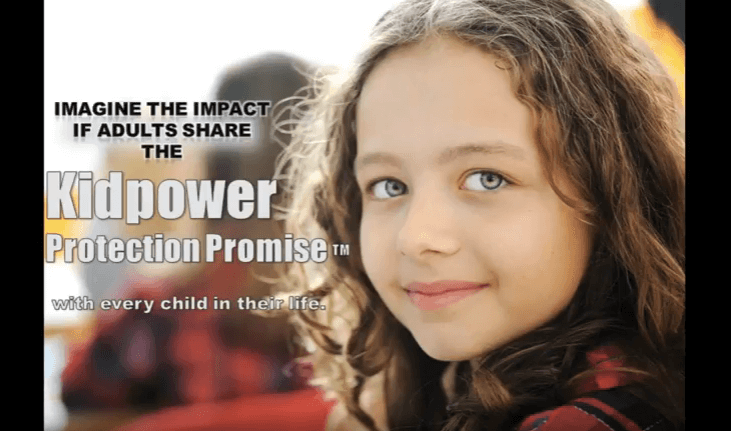 April is Child Abuse Protection Month: Take the Kidpower 30-Skill Challenge and Share a Story for a $300 Registration Discount! From the US to to Nigeria to Pakistan to Singapore, the Kidpower safety skills are easy to adapt for different cultures and needs. This experiential and empowering program provides a powerful opportunity for educators, mental health experts, safety officers, martial artists, health care providers, and parents to learn from Kidpower’s 29 years of experience in teaching child protection, positive communication, and social safety skills. Although the focus is on children and teens, participants have found that these skills are relevant for all ages, abilities, cultures, beliefs, and walks of life. Internationally-recognized intervention and advocacy skills and techniques proven to protect vulnerable people from most bullying, abuse, prejudice, violence, and other maltreatment. How to prepare children and teens to develop healthy and strong relationships. Tactics to empower young people to take charge of their own safety and well-being. Develop clear statements to address key concerns for the emotional and physical safety of the children and teens in their personal and professional lives. Learn, model, and present ten Kidpower Core Social Safety Skills. 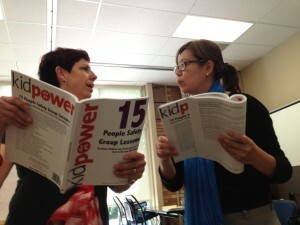 Use the Kidpower Positive Practice Method to coach interactive safety skills practices. Use the Kidpower Positive Practice Method of different skills as a management tool to address unsafe or disrespectful behavior. Adapt the teaching of core skills based on differences in age, cognitive ability, and physical ability, using different teaching tools. Identify and develop an action plan to integrate at least three strategies to communicate, uphold, and interpersonal boundaries in their own work. Identify and develop an action plan to integrate at least three additional child protection strategies they can use right away to improve safety, confidence, and communication in their school, practice, family, or other group. Demonstrate the ability to apply intervention and advocacy skills adapted to their unique service environments. 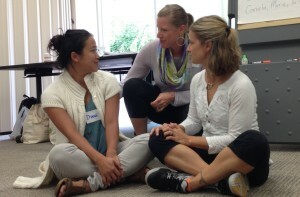 Institute participants practicing how to intervene powerfully and respectfully when young people are acting unsafely. Participants having fun while learning in small groups. Kidpower’s approach makes learning inspiring, relevant, and even fun, despite the seriousness of the issues we face. Now, I am feeling more prepared to teach about advocacy skills in our local context to prepare the parents I work with to advocate on behalf of their children. Professionals and parents from around the world gather to learn together. 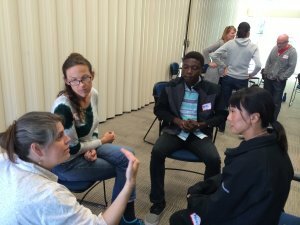 Small group discussions offer a chance to get questions answered and role-play solutions. As a stay-at-home mom, the Institute helped me learn many tools for setting boundaries and keeping my children safe, while also empowering me to speak up and be aware of my surroundings. I will be integrating Kidpower skills from the Institute into my work with Red Cross/Red Crescent Child Resilience trainings around the world. I have seen firsthand how the Kidpower Positive Practice Teaching Method strengthens skill development by actively engaging students with concepts and questions relevant to them. The 1250 USD registration fee includes pre-training preparation and one-on-one communication, the three-day program, and a follow-up consultation by phone, email, or Skype. Lodging, meals, and travel are not included. and 20% off for additional participants in your group! See our FAQ and email us before you register to request special payment plans or to discuss our limited partial scholarship options. The actual cost of this training with individualized participant pre-training and follow-up is more than 1800 USD/person. 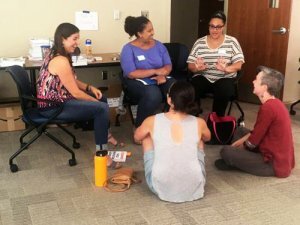 In an effort to make this training inclusive and available to individuals and small agencies who work with children and families in need, this training is substantially subsidized through donations to our organization. If you or your agency are able, please consider adding a donation with your registration to help cover these costs. 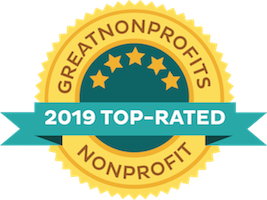 To inquire about attending a future Kidpower Child Protection Institute or to organize this one-of-a-kind, 3-day professional training for your organization or in your community, email safety@kidpower.org. Programming runs from 9am to 4pm each day with a break 12pm to 1pm for lunch. Leaders are available for individual consultation 4pm to 5pm each day. Practice teaching boundary setting role-plays with puppets to engage younger children. 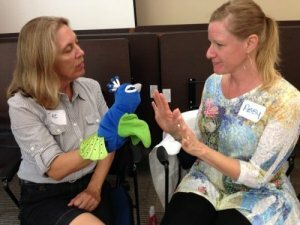 Participants use puppets to demonstrate a role-play for getting help from an adult. 1. What does the Institute fee cover? The registration fee includes pre-training preparation and one-on- one communication, the three-day program, the Child Protection Advocates Workbook, snacks during the day, and a follow-up consultation by phone, email, or Skype. Lodging, meals, and travel are not included. 2. Will I receive a Certificate of Completion? On request, participants who successfully complete this training can receive an electronic certificate of completion that is accepted for continuing education hours by many educational institutions and mental health agencies. 3. Are there any restrictions on my use of the program? However, unless people are certified as instructors by our organization, they do NOT have permission to call themselves “Kidpower Instructors;” say that they are teaching “Kidpower workshops;” nor use our copyrighted marketing or program language for promotion or fundraising. For further information about becoming certified by Kidpower to teach workshops under our auspices, please see our Instructor Training Program. 4. Will there be filming or photos? Because the Institute fees are highly subsidized, presentations by the trainers, including group practices, will be filmed and photographed at this event, which means that participants’ images will be visible. However, we will NOT film or photograph individual participants when they are doing separate practices or discussing specific situations without written prior permission. 5. May I film or photo? We will provide opportunities for filming or photos at specific times. In order not to distract other participants or to have videos taken of our program, we ask that participants do not make photos or videos during the other presentations and practices. 6. Are there other restrictions? 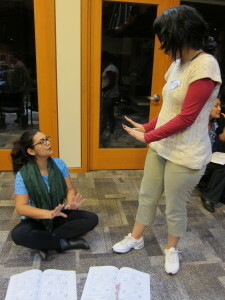 We ask that participants act in ways that uphold Kidpower’s values of safety and respect for everyone. Also, this is a non-smoking, scent-free environment. 7. What are the benefits of participating in the Institute? Kidpower’s social safety skills and strategies help to protect people of all ages, abilities, backgrounds, and cultures from bullying, abuse, harassment, prejudice, violence, and other maltreatment – and to prepare them to develop safe and strong relationships that enrich their lives. 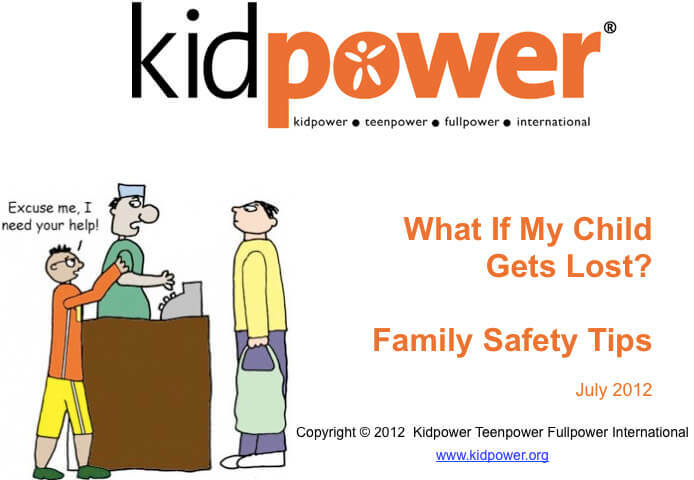 How to use Kidpower’s Put Safety First principles to take action to protect and empower young people and their adults. 12 Core Social -Safety Skill Sets to prepare young people to take charge of their safety, prevent problems, increase confidence, and develop strong relationships. Signs, statements, and policies to promote cultures of kindness, respect, and safety. How to use and teach How to Use and Teach Safety, Relationship Safety, and Positive Peer skills for different ages, abilities, cultures, and backgrounds. How to teach Self-protection skills to deal effectively with aggressive behavior. We provide a great deal of individual attention to answer specific questions from participants. Educators, health care providers, mental health professionals, law enforcement experts, and parents have joined us for trainings from around the world including Romania, Brazil, Guatemala, Mexico, Chile, Nigeria, Vietnam, Singapore, Australia, New Zealand, Pakistan, India, Canada, the UK, France, the Netherlands, Sweden, and the US. 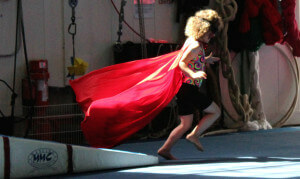 They have all reported great benefits from using the Kidpower program in their personal and professional lives. 8. What about lodging and food? We provide snacks and coffee or tea during the workshop. There are many low cost food options in the area for lunch and for food shopping. You can go out at lunchtime or bring your own lunch and visit with our training team members. 9. 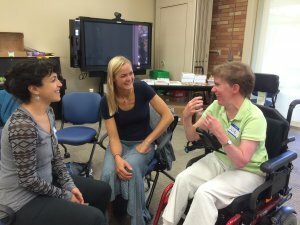 Are there other possibilities for participating in an Institute? 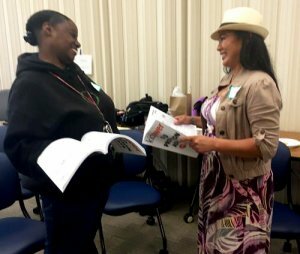 To inquire about attending a future Institute, or about organizing an Institute in your community, please email us at safety@kidpower.org. 10. Can I get the discount and pay later? Are there payment plan or scholarship options? We recognize that many Institute participants may have an agency or school process to get funding allocated and released, or may need to establish a payment plan in order to afford or get funds approved for their participation in the Institute. 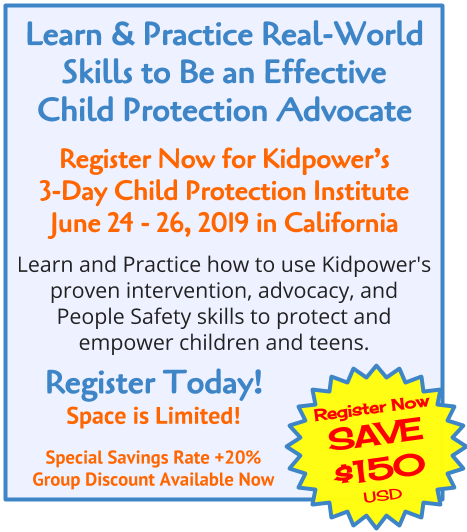 To preserve any discounted rate and your seat in the Institute, you must register online before the discount deadline AND contact Kidpower’s Central Office via email (safety@kidpower.org) to discuss your situation – either before, or within 2 business days after your registration. You may also email us to discuss the potential for receiving a partial scholarship. We are committed to working with you to come up with a payment agreement that works for you to attend. Kidpower will then issue an invoice with the agreed dates and fees included. You will be asked to pay a deposit and the invoice (payment agreement) will include dates when installment and/or final payments are due. If anything changes and you cannot make any payment by the due date, you must be in touch with us before the date for payment, or you will forfeit your spot in the Institute and refund or credit options, less your deposit fee, will be limited by our cancellation policy. 11. What if I need to cancel my registration? If you decide to cancel and notify Kidpower in writing and by telephone at least 45 days before the institute, you may cancel your registration and receive a full credit of the amount paid towards another Kidpower professional development training (Child Protection Institute or Core Program Training), to be used within two years, OR you may elect to receive a full refund, minus a $100 USD processing fee. If you cancel your registration with less than 45 days notice, but more than 5 business days notice, we offer a full credit of the amount paid towards another Kidpower professional development training, to be used within two years, OR a 50% refund. Institute registration credit (per person) can be applied to a single future Kidpower training. Institute registration credit cannot be applied to more than one public or private workshop fee. If you cancel with less than 5 business days notice or do not attend the Institute, we do not offer a credit or refund. Credit or refunds either in part or in full will be issued only in exceptional circumstances. We are also unable to offer any credit or refunds if we are contacted after the Institute has started. In the case of illness: Please let us know right away if you are too ill to come to the Institute. We often have waiting lists and want to give another person the opportunity to attend. If you wake up ill the day of the Institute, please contact us immediately. If we hear from you before the Institute, we can provide a one-time credit towards your registration fee for the next year’s Institute or a Core Program Training within one year, less a $100 USD processing fee. 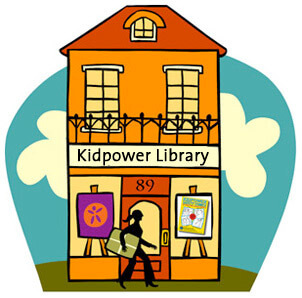 Kidpower reserves the right to cancel the Institute due to insufficient enrollment. Should we need to cancel the Institute, we will reschedule for another date. If we cancel the Institute, you may either choose to attend on an alternative date or request that we send you a full refund of the amount you paid. Participants pair up to rehearse how to turn problems into successful boundary setting practices. Participants discuss their next steps for implementing the skills and strategies they’ve learned at their own schools and agencies. 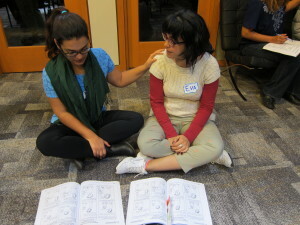 Participants practicing how to set boundaries on touch for different levels of intrusion, using a cartoon-illustrated lesson plan to guide the role play step-by-step. I came to the Institute to learn more about teaching self protective skills to children and teens. After searching the Internet for resources, i observed that Kidpower articulates the skills they teach well and in a fun and positive way. Personally, the Kidpower program has helped me to be more aware of the power within me and how I project it. Practicing these skills by using my body and voice was an empowering experience. It was also fun! I could feel the positive energy of the trainers and the spirit in which the skills are taught. Professionally, the Institute has been very useful as Kidpower names the skills and demonstrated so concretely that I left feeling confident about coaching my patients. Since returning, I have built in coaching these skills or concepts such as ‘problems should not be secrets’ and role played with my patients how to be persistent in getting help from adults as part of safety education and planning with the patients who were brought in for having experienced suspected child abuse. I used to think that advocacy is something anyone, especially parents, would do for their children but in my experience, some parents tend to advocate or think about safety less for their children either due to lack of awareness or due to other stressors in their lives. Now, I am feeling more prepared to teach about advocacy skills in our local context to prepare the parents I work with to advocate on behalf of their children. I first learned about Kidpower when I worked as a Child Protection programme manager in a Palestinian refugee camp in Lebanon some years ago. I had the opportunity to invite a Kidpower trainer to work with the social workers who were part of the programme. After observing the workshop, I was convinced that this was the missing link in the programme and that I needed to learn more about Kidpower. While observing the Kidpower workshop, I couldn’t help but think: ‘How I wish someone had taught me this when I was a kid!’ Many of the social workers felt the same way. On a professional level, I realised that this is what had been missing in our programme. 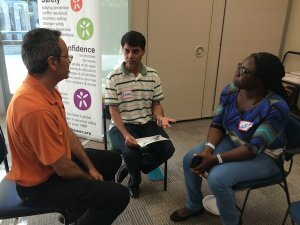 Instead of talking about child protection systems and the impact of child abuse, here was a trainer showing the social workers what to DO about it. They practised how to intervene and make a real difference in their daily work with children. It was so empowering. I am hoping to introduce Kidpower skills from the Institute in the Child Resilience trainings we do for Red Cross/Red Crescent volunteers all over the world, so they can pass on their skills to children living in conflict/disaster affected communities. I have seen firsthand how the Kidpower Positive Practice Teaching Method strengthens skill development by actively engaging students with concepts and questions relevant to them. 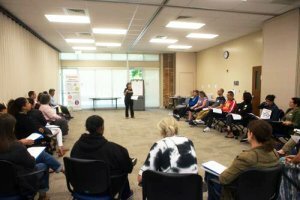 The Kidpower Institute gave our participating staff members valuable guidance and insights we are integrating in our ongoing process of making PCA trainings as effective, engaging, and relevant as possible. 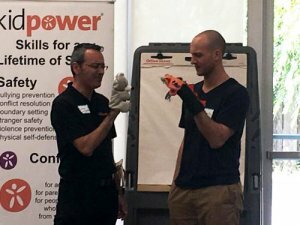 We have also appreciated the opportunity to incorporate ideas from Kidpower’s exceptional safety curriculum into our program. Kidpower has an outstanding track record of teaching parents and other caring adults effective skills without creating fear. As a public safety officer, I strongly believe that a great deal of violence, including bullying and abuse, could be prevented if everyone had these skills. 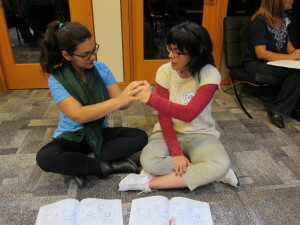 Our organization teaches workshops to children, parents, and teachers called, ‘Being a Child Should Not Have to Hurt!’ The Kidpower training I received was extremely valuable in preparing me to add the very positive practice of skills to the awareness and understanding that our program provides. Irene and the Kidpower team’s joyful and knowledgeable approach makes learning inspiring, relevant, and even fun, despite the seriousness of the issues we face. I look forward to continuing to partner with Kidpower to bring its important services to our country.